The other night we hung out in a tree-lined park with outdoor cafes and listened to live music by candlelight. And to top it off, we were a thousand miles from land. The Symphony of the Seas has six neighborhoods, and Central Park is my favorite. 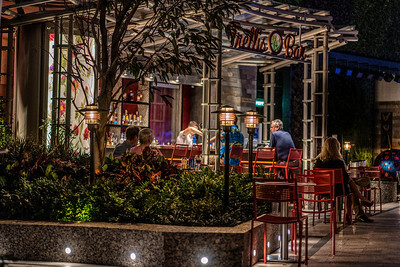 There are upscale restaurants with outdoor seating. At one end is Vintages, a wine bar where somehow, I end up at least once a day. In the afternoon, there might be one or two patrons, and you can sit at an outdoor table, and watch folks stroll by. There are way too many choices; neighborhoods, restaurants, nightclubs, sports, shopping, and bars. Speaking of which; there are at least sixteen different bars, and I had a plan to try each one. I'm only halfway through, and it's not looking like I'll hit the goal. But rest assured, it's not for lack of trying. You'll forgive me if I post another photo of the rain. Personally, it's something I can't get enough and just think it's kinda cool. Taking photos in the rain is akin to low light photography, the weather has a way of creating a mood. In Europe, it's enhanced by the architecture of the old streets. 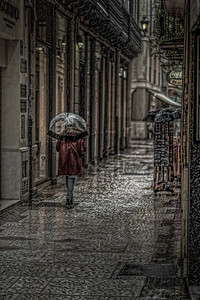 This was taken on a rainy October day in Malaga when I got soaked to the bone. About a year or two prior I did the same thing in Solerno. Back then I bought an umbrella from a vendor who magically appeared as soon as the rain started. I paid too much for the umbrella and then lost it on a bus. I've since given up on umbrellas when taking photos. Besides, it's not really feasible to hold an umbrella and take a picture, unless you have three arms. Last week we were in Malaga for a day as our ship made it's only port of call before crossing the Atlantic. As luck would have it, it rained cats and dogs, which was perfect for my purposes. I like shooting at night, but if I have to take photos in a European city during the day, rain is my next best friend. It puts everyone a little out of sorts as they rush to and fro with umbrellas. It also creates that nice sheen on the ground to add a little extra something to the image. The only catch is you have to be willing to get wet, which I did, beyond a reasonable doubt. I had been here previously when I was about eleven years old. When I saw the section of the city that faced the port, little bubbles of long lost memories began to percolate. My conscious mind has long folded over those early years, but it would've been nice to have an old photo to help free more bubbles. Nevertheless, I was struck with the desire to return and explore a little more. So I will plan on that, and when I do, who knows what I might uncover. It might be an understatement to say it was raining cats and dogs in Malaga. But that's of little consequence when you traveled over four thousand miles to get here. I was determined to go out, come hell or high water. The universe obliged and gave me high water. I wore jeans, a light rain shell and got utterly soaked. The bus pass in my pocket was unreadable and plastered flat against my iPhone. When I showed it to the driver, she seemed more worried about my phone than the pass. Thankfully, iPhones are water resistant these days. Speaking of which, I've read a lot about how the Sony a7RM3 is "water resistant," so I decided to put it to the test. Imagine standing under a sprinkler. A little moisture got onto the lens mount, and the camera started giving me error warnings; however the camera and lens continued to operate, and I didn't lose any shots. The camera got soaking wet. When I got back to the ship, I let it dry for a few hours, and it was perfectly fine. I suspect a tighter lens fit of a pro-grade GM lens would have eliminated that issue, but I was using the consumer grade 85mm f1.8, which I love as a lightweight travel lens. All in all, I had a blast and, it was a good test of equipment and perhaps, my own craziness. They have it all wrong because I think ice cream is the real gateway drug. And besides, it's highly addictive. 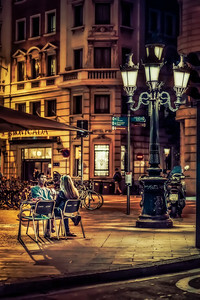 I want to be in Barcelona at La Rambla on a warm night having an ice cream cone. I can be clumsy with food, so I got a small cup instead. There's something about walking around with ice cream; for the time it takes to eat, reality gets suspended, and you have not a care in the world. 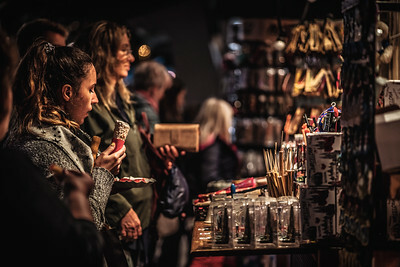 We were walking back to our hotel after spending time in the gothic quarter, and I was randomly snapping photos of people and vendors. For me, this captures some of the magic of that night, and believe me; there is always a bit of magic here. But now looking at it again, I think it might be time for ice cream. Not that I'm addicted or anything like that. It's odd seeing an American sports bar in Spain. Maybe the NBA is popular here, what do I know? Or perhaps it just caters to American tourists. I was in Barcelona for only a day, so I took pictures of everything and anything. These are the windows of the NBA Cafe on La Rambla. Anyway, I just thought it was cool how the windows were outlined with neon lights. Like I said, anything and everything. I left my wife in a shoe store as I walked around taking photos in the old streets of Barcelona. This is not your typical mall. There's something pleasing about photos of people juxtaposed to the surrounding buildings; especially when the buildings are very old or very new. Even if the people are just going shopping, it's better than hanging out at the mall. Malls are becoming a thing of the past. Or, maybe, they are morphing into something else, less mall-like. I'm not sure I buy into that because as long as you have to drive to a mall, it's still a mall. But I digress. Where was I? Walking towards Plaça de Catalunya, we passed this shop. 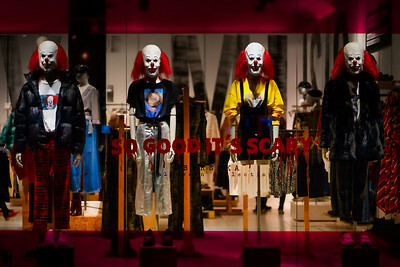 It seems Halloween is popular in Spain as well, or maybe just in retail. Nevertheless, I was dressed as a tourist. This is Barcelona's shopping district, and there is no shortage of things to see. The Barcelona Apple store is right next door and, man oh man is that a nice store; good thing I didn't go in. Shopping and I don't get along well, shopping always wins. Speaking of which, we were headed to La Ramblas to get Crystal her Espadrilles. Whenever we return, we go to Toni Pons in the Latin Quarter to get Espadrilles. They are less expensive in Spain and, they are made locally. While she was doing that, I went to take photos. The only problem with that is that I can lose track of time, but somehow I managed to snap out of it and meet her just as she was exiting the store with a big bag of shoes. Sometimes you need to walk the walk. If you do, it may as well be by the river in the evening when I'm taking photos. That way if you happen to step in front of my camera, it might make for a good picture. Every day I try to come up with a few sentences about a photo that I'm publishing. Maybe it's not necessary, but I do it anyway to add to the story. I never know what I'll write, but something usually comes to mind, like a memory of the moment when I snapped the shutter. But sometimes I draw a big fat blank and can't think of a thing to say. At those times I resort to a little creative writing. Yes, you are correct, this is one of those times. Today, I can't think of a thing I want to say about this photo. It's just some guy along the river that walked in front of my camera. Lummus Park runs parallel to Ocean Drive in South Beach. I was riding a bike here and taking photos in the middle of the day. I usually prefer to go out when the light is softer, but I thought to myself, what the heck. The summer sun in Miami Beach is relentless, so I saw quite a few people walking with umbrellas. As for me, I made sure I had an umbrella in my drink. I figure if I collect enough of them I can use them for the sun. For this shot, I lined it up and waited for the ladies to walk in the scene. It's an easy technique, and I use it a lot when I do street photography. I suppose this is a street photo, although part of me wants to call it a beach photo. It really doesn't matter; it's just my analytical side working overtime. I like renting a bike in Miami beach to get off the beaten path. I want to see how the natives live which, in reality, is exactly as I do. For me, the challenge with urban photography is finding an angle that's not crappy. But that's just me, and at the same time, I love the work of photographers that show urban grittiness, like Thomas Hawk. His work is not crappy, but it shows ugly details. Nevertheless, I spend hours looking at his work on Flickr. It comes down to what I'm comfortable with, even if I get inspiration from different styles. Anyway, this is my take on South Beach urbanism, which is more of an ideal than the reality. Because if I turned the camera just a little, you would see all the grittiness of telephone wires, parked cars, and liquor stores. But if Tomas Hawk did it, it would be okay. When I was last in Miami Beach, I hung around Ocean Drive. This is one of the many spots where they serve those half-gallon Margaritas. Only in Miami. This colors on this were so loud and crazy that I opted for monochrome to focus more on the people. These kinds of street scenes are fun to look at later, away from the sounds and heat of the moment. It's taking a glimpse into a snap of time and spinning a tale in our mind of what was going on. Sometimes, I get looks from people that make me a little self-conscious. I don't mind if it's just people looking at me and wondering, but in places like this, there are quite often celebrities. I'm not into the whole celebrity thing and am really bad at recognizing faces. But I do occasional snap a star, so I hope they will realize that I'm just some guy without an agenda that probably just finished one of those half-gallon Margaritas. Ocean Drive in Miami Beach on a Monday night. And the later I stayed, the busier it got. I repeat, it was Monday. But then I shouldn't be surprised, because when I'm on vacation, every day is Saturday and most of the people in South Beach are on vacation. So it could be Sunday, Monday or Tuesday night and the place is still going to be full of life. As I look at this photo, I wonder why they had two TVs set up outside? I get it with TVs in restaurants, but to set two up on the sidewalk seems a little extreme. It's not enough that we are continually communing with our phones. I'm as guilty as anyone. But maybe it's a good idea to get unplugged, if even for a couple of hours while we eat. Perhaps I'll try that tonight, as long as there's nothing important on. 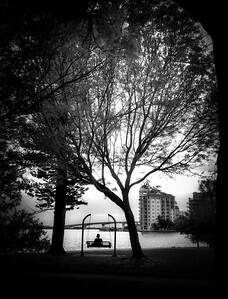 This image is for me a study in the transformation of a scene. The photo was taken in daylight inside the old walls of Aigues-Mortes, southern France. However the photo appears to be in the evening. It’s an example of what I imagined verses what I saw. Street signs, power lines and crowds were all removed. I worked on the tones and the light. I added the illumination of the lamps and a sunset through the portal. Finally I added shadows and some subtle shades. In reality there is very little reality in the image. But is there reality in a novel, movie or painting? They’re all renderings of an artist. Sometimes I tire of reality and prefer the world of imagination. I am a practical guy so these explorations are a departure from the routine of daily life. Given how much time we spend in the day-to-day it’s advisable to escape for a while. For me, that means simply transforming a scene from day to night. I was stranded in Barcelona for a few days due to bad weather back in Florida. If there was ever a place I would want to be stranded, it’s Barcelona. On my last night I went out late and took a bunch of photos of street scenes. It was well past midnight yet the narrow streets were full of people. I stayed mostly in the gothic quarter between La Rambla and Via Laietana. 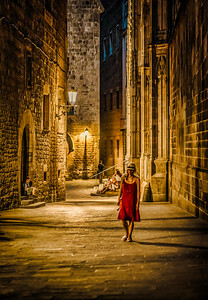 After two or three experiences like this I would have to say that Barcelona is my favorite place for street photography at night. People are contrasted against by the old world architecture and it creates scenes that are not possible in North America. Some of the buildings have been around since before America was founded so the feeling is exquisite. When I’m here I shoot as many street images as I can, even if they don’t all turn out. At least I’ll have a record of how much fun I had. I cannot get enough of Barcelona. 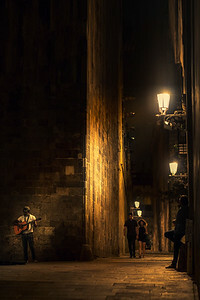 On this weekday night there were musicians singing in alleyways with the sound of their songs reverberating against the high stone walls. Bistros and cafes were open with people talking until morning. Others were just walking around having fun and laughing. Maybe it’s the Catalonian culture I witnessed but it sure was awesome to be out taking photos of it. Probably the best way to know if you like a place is to gauge how you feel when you are about to leave. I feel a little bit sad when I leave Barcelona. There are not many places that do that to me. I know I’ll just have to go back and plug into that Catalonian vibe again soon. To be honest, I don't remember taking this photo. No matter how many images I make, I usually remember each one. Pictures to me are memory boosters, I only have to look, and I'm transported back in time: I'll have a recollection, however vague, of that moment. But for whatever reason, this one escapes me. I was shooting with a wide open aperture and high ISO so that I could snap photos as I saw them. I was a little like a snap-happy tourist. I'll call it street photography but, I was having fun, so maybe a bit of each. Barcelona is one of those places where the architecture steals the show. The architecture is old, and it belies the fantastic amount of history in these walls. To me the street lamps have an 18th century feel to them, and perhaps some of them are that old. When they finally invent the time machine, I'll be coming back here to take a few more photos to see if it looks the same. Hopefully, I won't change history while I'm at it. 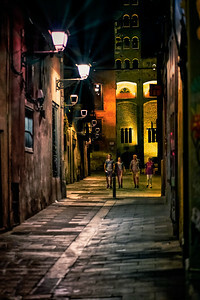 Here is a shot I took last year on my last night in Barcelona. I was "stuck" there while a Hurricane passed through my home in Florida. It's not something I'd wish on anyone, but as long as we were stranded, I could think of no better place to be. Barcelona has a unique energy to it, and it's super easy to pass the time. In a city like this, people are out walking and socializing late into the night. It's fun to be in the middle of it all while taking photos. 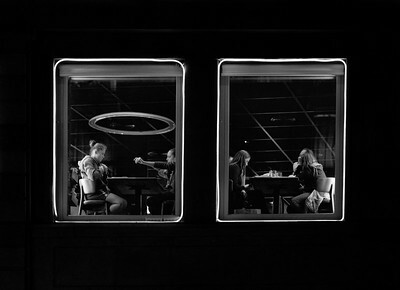 For whatever reason, nighttime street photography is something that gets my creative juices flowing. There is something about the lighting that changes the mood completely. For this scene, I selected a particularly gritty looking corner. The idea is to use the light and leading line to draw the eyes across the image from left to right and into the busy intersection. This type of lighting reminds me of scenes from movies; it gives me an appreciation for good cinematography. In another life, I think I might spend my time here making film noir type movies. 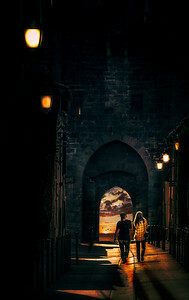 This image was taken in the gothic section of Barcelona on my last night there. I was standing next to the cathedral listening to musicians and taking photos of people walking down Carrer del Bisbe. Coming from North America, this is an enchanting place. I can't describe it in words, I try with pictures, and yet it still falls short. You have to experience it for yourself. I'll be going back in a couple of months, so I hope to get out in the gothic section again. Anyway, this is a street scene, a night scene, and an architecture scene all wrapped into a single image. I'm not sure what to call it, but it's a lot of fun. For me, the appeal is shooting at night when everything takes on an almost mythical quality. You can imagine the same spot hundreds of years ago and see with your mind's eye the same scenes, unchanged over the centuries. On my last night in Barcelona I walked around the gothic quarter until quite late. For some reason I always find cool things to see near the old cathedral. In this case it was some guy with a guitar singing classic ballads from Bob Marley, Tracy Chapman and others. He had a full voice and his melodies echoed against the walls of the ancient cathedral. When I first came upon him there were only a three people listening, but within fifteen minutes he had gathered a crowd of thirty. He was so good that it left an impression on me and I can still hear him in my head. But I think it’s not unusual for a summer nights in Barcelona. That’s why it is one of my favorite places to hang out. 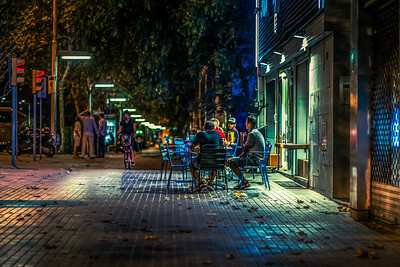 Scenes like this are very much why I like street photography at night. There is a completely different atmosphere and mood, and when that is combined with amazing architecture and music it’s irresistible. As an American, one thing I will say about Europeans is they have an evolved sense of style. I took this in central Bologna around noon while I was busy snapping pictures of people. Most of my people pictures were not very good but this one I liked. It makes me think of the differences between Europeans and Americans. I could have spent my time taking pictures of the architecture and ancient landmarks, but the Europeans and their culture intrigue me. It’s instructive to observe how they carry themselves in everyday settings. By taking pictures of people in different places I am recording something a little more ephemeral than a ninth century church. Not that there’s anything wrong with ninth century churches. If you walk around and observe things around you, interesting things appear, they happen all the time. This lady has a delightful style and, she’s using a bike. The scene is reminiscent of something I’d expect to see in a fashion ad. If I saw something this in the little town in Florida where I live I would know for certain that hell had frozen over. But here in Italy a fashionable lifestyle is as common as an ancient church. 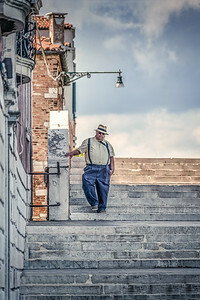 I wasn’t in Venice long but managed to walk along the city edges one afternoon where I saw things resembling normal life. If you stray away from the main square you eventually end up in areas were things are a little quieter. I have no idea who this man is, but looking at this several weeks later reminded me of what I was thinking about at the time. Amongst the canals and stone houses are things like a grocery store, a florist and a hospital. I saw city workers picking up the trash. It was those kinds of domestic norms that I found oddly comforting. Walking through an unfamiliar environment can be a disorienting until you recognize things that we have in common, then it starts to feel a little less foreign. It’s nice to see the historic squares and cathedrals, but seeing how people live day to day is just as interesting. W all go through the similar routines of life, yet we are also products of our environment, language and culture. So casually observing the interplay of these in a quiet section of town can be just as fulfilling as standing in the middle of St Marks Square. 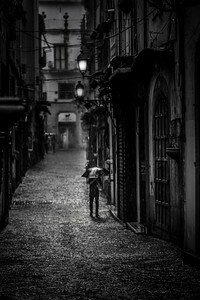 When I was in Salerno it rained like cats and dogs. Italy had been in a drought that was just broken with a few days of heavy rain. Despite that I was happy to walk around looking for compositions while sheltering under entryways. I took this during one particularly heavy downpour. I was forced to stay in one spot for an extended period, which in retrospect was a good thing. It’s sometimes better to pick a spot and let the world come to you. If you wait patiently, all kinds of interesting scenes will appear no matter where you are. This is in an old shopping district of Salerno. The buildings and shops looked like they haven’t changed much in a hundred years. I got the sense that some shop keepers carried on traditions from one generation to the next. As the rain let up I continued to walk and eventually the narrow streets opened up into a newer section of town. The shops there were brand-name boutiques you’d recognize in any mall. As for me I preferred the character of the old section much more. It was one of the hottest days of the year, and for the life of me, I couldn't imagine why anyone would carry a sweater. Maybe the stores were air-conditioned in the shopping district of this Italian port city. In Florida, we freeze going to a movie in summer. You dress in shorts and flipflops but then need a jacket in the theater. When I was here in Solerno, it rained cats and dogs in the morning, and within an hour the streets dried up from the heat. I got a wide range of pictures that day that included different types of weather. It reminded me of Florida summers but with a lot more to explore. I took this while walking around in the rain in the middle of summer. Even though it was raining it was warm and humid, not unlike Florida. However unlike Florida the energy of the city was entirely unique to me. I was very happy to be here, especially in the rain, because of the atmosphere it created. For each image this week I’ve used Topaz to render part of the scene in an impressionistic style. 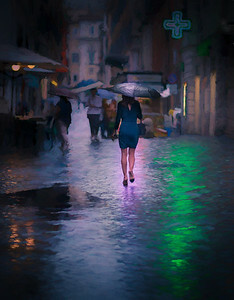 In this scene all but the central subject has been “painted” by the software while I blended in the original image of the lady with the umbrella. Having the ability to blend photos opens up choices in terms of artistic expression. I combine renderings of the software with realistic aspects of a photo. Then I work with color, saturation, contrast and shadows so I can re-create a scene more from my mind than actual event. In some cases that suits my preferences as it relates to photography. I’ll continue to use this technique here and there. It’s all part of a creative process enabled by a fusion of technology, personal expression and photography. The day I was in Rome it rained for the first time in over five months. 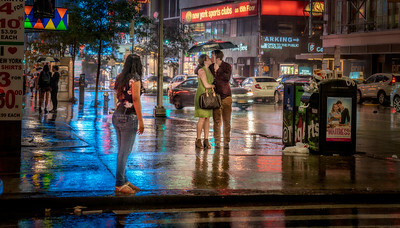 It was a miracle for at least two reasons; the region desperately needed the precipitation and I desperately needed to take pictures of people in the rain. 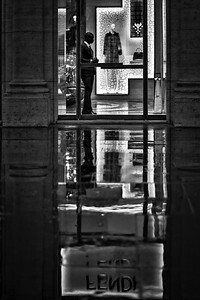 If you follow the blog you know street photos in the rain are high on my list. 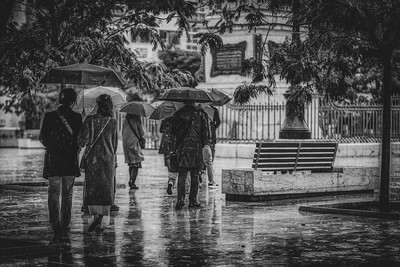 People carrying umbrellas, reflections, sheen of the pavement and actions of people trying to avoid the rain all combine to make for interesting studies. 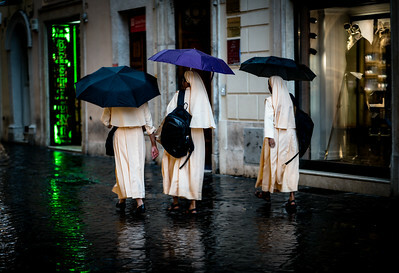 Of course being in Rome is a bonus too because people are likely to be dressed in interesting ways like these three nuns. I have no idea who they were or where they were going but it doesn’t matter, they made the scene. In fact when I saw them I was across the street I ran through traffic in the rain to capture them as turned into this alley. I get a little carried away, but that’s part of the fun of capturing these types of images. It’s exciting for me because where I live people don’t walk around in the rain. But small towns in Florida and big cities in Europe are two different things and it’s no use drawing comparisons. 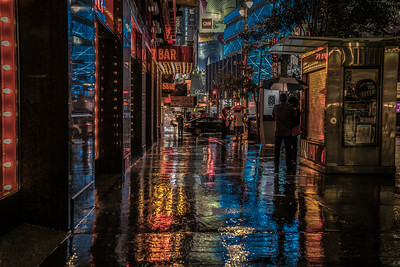 When I was in New York City it rained as well and I spent hours in it taking pictures. My camera is not waterproof, but I carry a plastic bag with a hole in the back so that the camera stays dry while I shoot. It’s entirely low-tech but it works. If I could only manage to keep my shoes as dry then that would be a miracle. We were standing outside in Vatican City when it started rain like cats and dogs. We wanted to see the basilica but that meant waiting in line for over an hour under an umbrella. So, as the rain wasn’t stopping we decided to hail a cab and head over to Rome’s shopping district. I have no idea where the “shopping district” is, but this is from there. 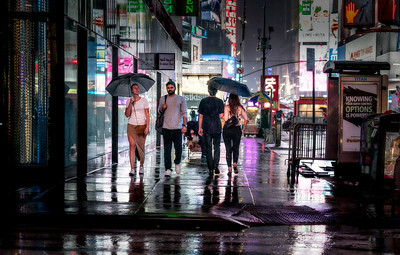 I’d recently been out taking photos in the rain in New York City. Doing it again in Rome felt a little familiar and I was glad I carried a plastic bag to keep my camera dry. 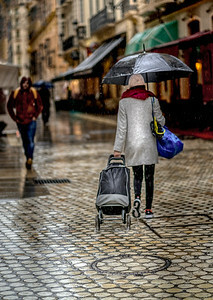 I know this doesn’t sound fun, but I like these kinds of rainy day urban photos and I can’t help but get a little carried away. 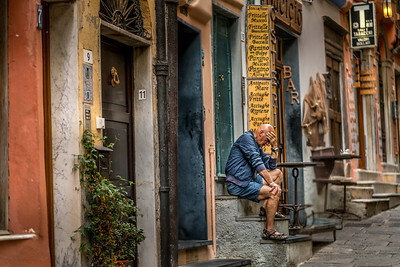 It was one of the last days of summer holidays for Italians so the streets were already empty. Add to that the unexpected rain and the shopkeepers were standing around looking bored with nothing to do. I took a bunch of photos there and ran for cover when the rain got too heavy. Sometimes we ran into a shop, other times it was an amazing cathedral, there are so many in Rome. Regardless, it was a much better way to spend the afternoon than standing in line under an umbrella. I snapped this while walking through the streets of Calata Doria in Liguria Italy. Try as he could, this gentleman couldn’t remember what he had for dinner last night. I offered a suggestion but he said they didn’t have a Taco Bell nearby. This is my version fake news. For some reason this man looks distressed but in reality I don’t recall that being the case, he was just taking a load off his feet and I happen to catch him with his hands just so. We all make expressions throughout the day that if taken out of context can send the wrong impression. I feel a little like paparazzi when I take street photos of people. I prefer to have people look natural, but if they see me aiming they’ll react. The idea is to capture people unaware; it’s a more interesting study of human behavior. The trick is to be as unobtrusive as possible. One technique is to line up a scene and wait for someone to walk through it. But if I’m too obvious folks stop and wait for me to finish, it gets a little awkward. I suppose if I were real a member of the paparazzi I’d know how to do these things real well and not feel awkward. Then I maybe could get on board with the whole fake news thing, …or not. 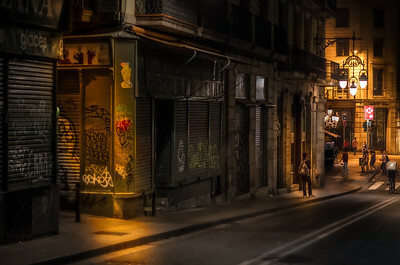 Here is a street scene from a section of Barcelona that's not too far from the beach. I took this from a moving pedicab that we hired late one night from La Ramblas to the Hotel Arts. Our driver was a German fellow who biked all over Europe and stayed summers in Barcelona to work the pedicabs. Taking photos from any kind of moving vehicle at night is a challenge, but with a high enough ISO and a wide aperture it's doable. And a pedicab is a lot easier to shoot from than a taxicab, although I've tried that as well. The days and nights we were in Barcelona were very warm. Here is a street scene from a section of Barcelona that's not too far from the beach. I took this from a moving pedicab that we hired late one night from La Ramblas to the Hotel Arts. Our driver was a German fellow who biked all over Europe and stayed summers in Barcelona to work the pedicabs. Taking photos from any kind of moving vehicle at night is a challenge, but with a high enough ISO and a wide aperture it's doable. And a pedicab is a lot easier to shoot from than a taxicab, although I've tried that as well. The days and nights we were in Barcelona were very warm. One of the things I like most about Barcelona is how people spend a lot of time socializing in front of little cafes and bistros. That goes for much of Europe but Barcelona in particular. 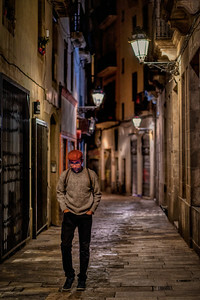 One of my favorite things to do in Barcelona is to take pictures of people walking around the gothic quarter at night, especially next to the main cathedral. 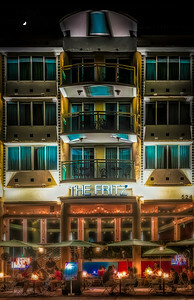 The architecture and lighting creating a setting that is good for night photography. As write this I am in Barcelona by accident; I was scheduled to return home but my flights were cancelled. That gives an extra day to explore one of my favorite cities at night. 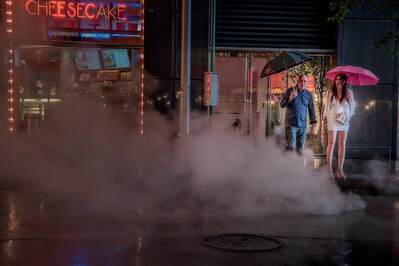 Images like this illustrate my preference for shooting scenes at night. In my mind it’s more interesting than daytime. It’s not just the time of day but the location. In Barcelona there are people out walking around at all hours. Those people and their sense of style surrounded by the ancient architecture create the perfect settings for this type of image making. One thing that helps is a fast lens. I used an f1.8, which lets in more light. That’s necessary for handheld night photography without a tripod. That in turn allows me to quickly capture scenes with little setup. In this case I am using an ISO of 1600, which is high but well within the means of today’s cameras. The technology will only get better and these types of shots will become easier to capture. Having that combination in a city like Barcelona is a very good thing. I’ve seen this guy playing the saxophone in Central Park several times before; he’s what I’d consider a permanent fixture. I stopped to take his picture and then left a few dollars in his case. When I was here about five years ago I saw another guy playing the guitar. I was at a train station in another city and someone was some guy playing a didgeridoo. No far beyond were other musicians waiting their turn. That got me thinking about how they stake out these popular spots. I imagine it’s first come first serve. For prime locations like this in Central Park you probably show up early and once you start playing you don’t stop until you’re done, then the next guy takes over. It’s a dog eat dog world for buskers. Recently I was walking along a street and there was a lone piano chained to a lamppost. When I walk back later a lady was playing a sonata as only an accomplished musician can do, it was stunning and several of us were stopped in our tracks listening to a recital. Subways and tunnels are the perfect location because they concentrate people in confined spaces and you have a captive audience. Quite frankly it’s where I’ve heard some of the most talented musicians. What better way to practice than to perform in a public space? If I could play music I’d be out there too, but I take photos so I’ll just stick to what I know. Here is a series of shots I took last year when in NYC. 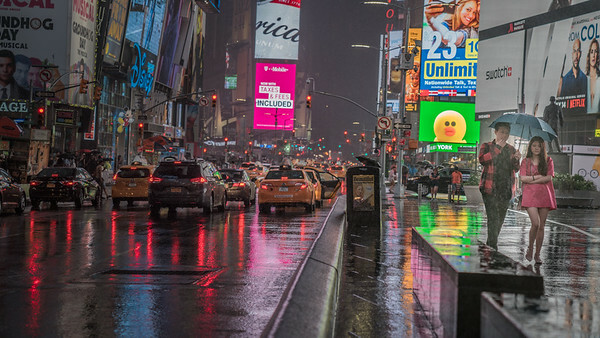 I walked to Times Square late at night in the pouring rain. While that may not sound fun, it's an excellent time to do street photography. 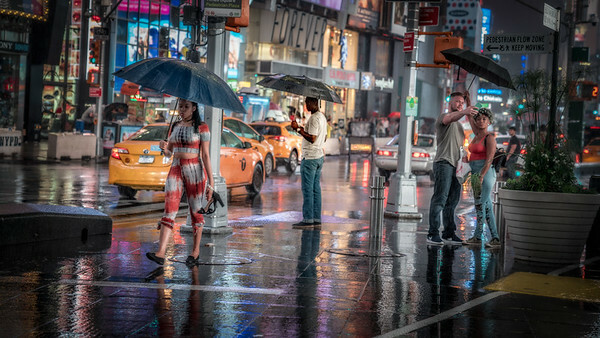 The combination of lights, reflections, and umbrellas create scenes that are fun to watch, in a people-watching kind of way. Because of the rain and the late hour, there were far fewer people out than usual. If you've ever been to Times Square then you know that's rare. It meant I was able to capture little vignettes without too many distractions. Each of these photos tells a different story from that evening. It is up to you the viewer to imagine what that story is. 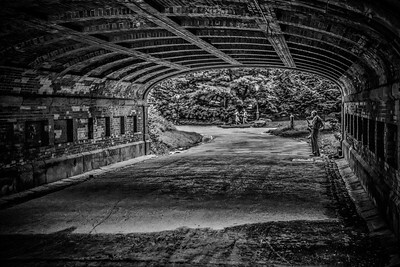 As the name of the series suggests, I've employed a vignette technique to each of these images to draw attention to the people. The setting, while electric, is only that, a setting. Each story is as different as the people that inhabit them. Last year I was in New York City on the hottest three days of the year. It was unbelievably hot and the only thing to do at night was to walk around Times Square in the pouring rain. I should be used to the heat from Florida, but it was no easier. Nevertheless, the rain and lights created fantastic photo opportunities that are entirely different than those I get back home. A nice effect is how the rainwater creates a reflective sheen on the pavement. Taking photos at night in a city is a matter of experimentation. With a camera, we have several choices to make. 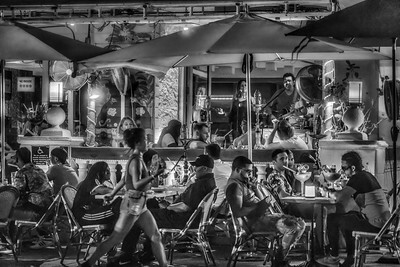 A wide aperture combined with a high ISO allows a type of street photography without a tripod. However, with a tripod, we can take longer exposures if we want to capture light trails. In this case, I just wanted to capture images of the scene without special effects. For me, the most exciting thing was watching people out having fun in the rain; which by the way, was what I was doing also. As luck would have it I ended up in New York on the hottest three days of summer. It was stifling during the day and muggy late into the evening. 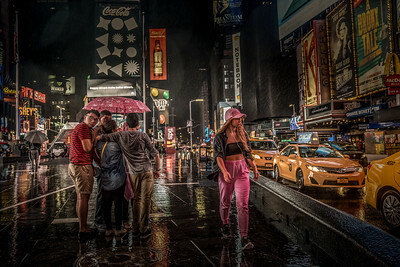 When it started to rain I headed down to Times Square to take some photos. Despite the crazy weather some people still showed up to see the sights. It was an amazing experience to be there in those conditions because there was so much to photograph. I have an idea in my mind to capture people in crowded places. It seems I’m always travelling to places that are heavily populated. So rather than try to pretend people are not there I look for ways to make the crowds part of the composition. I enjoy this idea because it allows me to examine things in a different light. The images are studies of crowds and crowded places. A natural inclination for landscape photography is to not include people but with urban exploration it has a different set of rules. Maybe I see aspects of myself in the faces of crowds. Regardless, it’s why I call these types of images studies, because from them, I have something to learn. This is a shot that I had a lot of fun making. I went walking down Broadway late at night in the pouring rain. 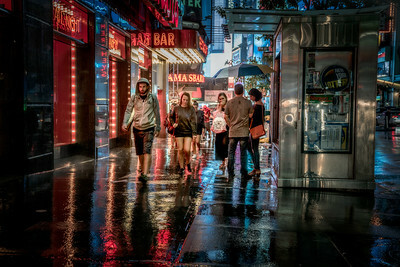 Shooting street scenes in the city is fun enough, but add the lights reflecting on rain slicked streets and it takes it to a whole new level. 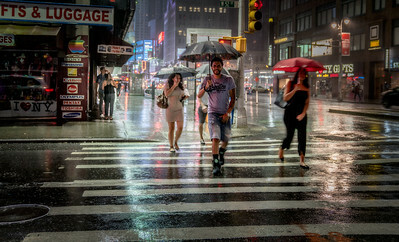 And of course, being New York, there are always people out walking regardless of the weather. I was a block from Times Square and there were lights everywhere. The colors of this scene were so vivid it almost looked unreal. At the time it seemed normal, but that’s what happens when you’re in the middle of the city, wild lights everywhere start to seem normal. I had my camera covered with plastic and I was wearing a rain poncho. I must have been quite the site, but then maybe not. 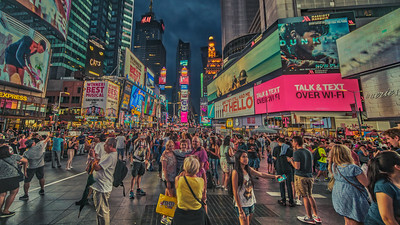 What could look more normal than someone with a camera in Times Square? I wasn’t the only one; I saw one or two others looking for cool shots as well. Rain seems to bring out the photographers, at least the ones that are visiting. I was out for a couple of hours and people kept emptying out of bars and walking around looking for places to eat. That was me back in my twenties. Now I’m content just to take pictures of people doing what I used to do. In a way I think that’s kind of funny. I've heard it said that eventually, everyone passes through Times Square. There's no way to describe it unless you've been there; it's electric. Last week I was talking about telling stories with simple images at the beach, but this is an example of a subject that's the polar opposite of serenity and sunsets. Regardless of the scene, success comes about by framing an image in a way that allows the viewer to enter it and muse about what is going on. If you want to tell stories with your photos, it doesn't matter what the scene is. It could be a beach, a farm, a city or anything in-between. I find that having a sense of depth draws us into the scene. We start at items close up and then wander around establishing distance and placement. It happens so fast we don't notice, but crafting scenes are what makes photography so enjoyable. It's a subtle version of virtual reality based on immersion. If we are, even for an instant, immersed in a photo, then we've experienced a form of virtual reality. Stories when told by a picture or a book, have always been a way to experience a different reality. This time of year we have colorful clouds at dusk nearly every night. This is a shot from a few days ago in my neighborhood. Normally for a shot like this I would use a tripod but because I ran out of my house it was hand held as I stood at the base of the street in awe. Getting this to shot to turn out pushes the Sony sensor to the edge of its limits in terms of recovering shadows and details. If you zoom in you can pick out a lot of noise and flaws, but the point is I was able to get an amazing scene in unfavorable conditions and on a moments notice. I wish I had used a tripod, but in the end the Sony sensor compensated very well. Where I live there seems to be some kind of atmospheric border. 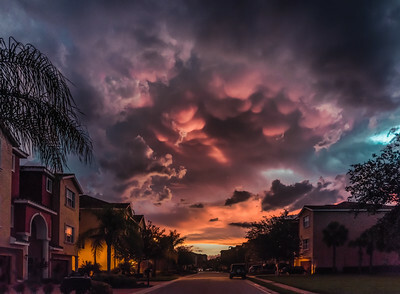 At around sunset each day the east boils with violent ominous clouds and the west is lit with broken clouds in a cascade of colors. I will see completely different weather depending on which window I look out of. It seems like the border between these two conditions is right over street. As soon as the sun sets the clouds settle down and any local storms subside. The tropical climate here can be truly different from one block to the next. By the next morning the sky is blue without a hint of any drama or clouds. But as soon as the sun heats up the clouds re-appear as though out of thin air. They get thicker and more dramatic throughout the day until we get afternoon thunderstorms, which then dissipate at around sunset. It’s a predictable pattern that repeats each day. Only when we get tropical depressions from the Atlantic or the Gulf does this change. Then it’s anyone’s guess as to what will happen. I use random people in scenes all the time. Sometimes a person is positioned in such a way as to create a scene. 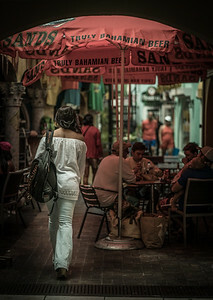 Street photography is all about people in scenes. 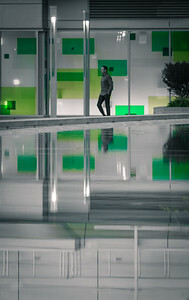 One technique is to create compositions where people are juxtaposed to nearby architecture or structures. A simple example is a person waking past an archway. Looking for a composition is like a game; you feel a sense of accomplishment when you capture one. I haven’t played but maybe it’s a little like Pokémon Go. 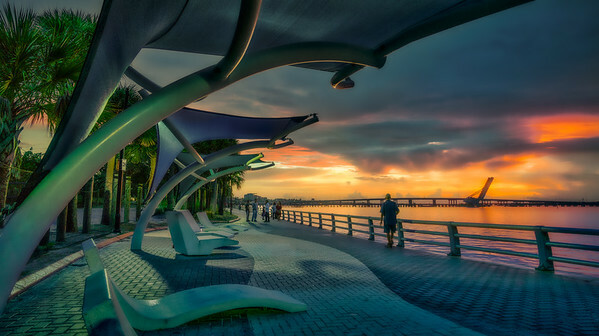 I took this at Bayfront Park in Sarasota recently. The park is an island with a trail around it and these swings are spaced every fifty meters. I come here when I want to do a mixture of people and landscape photography; it has plenty of both. As I walked behind this lady I think she knew I was taking pictures because she glanced back. She didn't seem to mind so I paused to get several more. I use people in this way all the time. Of course it’s better to be coy about it, if people become aware of what your doing they may change their behavior. Lately I’ve taken to carrying only a small 35mm lens on my camera. That way it doesn’t stand out so much and I can almost pretend I’m a casual shutterbug. In reality I’m on an undercover mission. One time it backfired on me. I was trying to be nonchalant as I took a picture of a rundown garage in a gritty part of town. The people inside thought I was snooping on them and started yelling at me. It turned out okay but I should have asked first. Most people don’t mind if they know what you’re doing. And if they do mind, well, no biggie, it’s just a game. I took this with the new lens that I purchased from Sony. It’s a 85mm and I shot it wide open at f1.8. I’ve been missing this focal length since switching from Nikon several years ago. I could have purchased one earlier but for one reason or another never got around to it. I’m glad I waited because from what I can tell this new version performs identical to lenses three times it’s price. The first time I used it was on a trip to the Bahamas. As we were walking through the shops and alleyways I took a few shots to see what it could do. Yesterday I wrote about how street photograph allows us to study a scene later. As for myself, I miss a lot of little details when I’m in the scene. I think we all do that, its natural. If three people walk into a place, each will see something different, like the three blind men and an elephant story. Maybe it’s wired into our DNA that we scan for predators which prevents us from seeing everything clearly. This is where photography can play a role. It gives us a second chance to go back and see what was really going on. When I compare a photo to what I thought was going on it’s usually different to one degree or another. Each type of lens allows us to record the same scene from a different perspective. Stand in one spot and aim the camera using a telephoto lens. Then aim it at the same spot with a wide-angle lens. Each capture will create a very different image. Since each focal length creates a different perspective, choosing one allow us to go back later and see what we missed from that perspective. And of course there are infinite possibilities. I think I’ve analyzed the hell out of that for now, but hey, that’s just how my brain works sometimes. Maybe I could just sum up the whole subject by saying that I’m digging the world at 85mm. More than once on the blog I've mentioned that I prefer pictorialism to realism. I also prefer impressionism although I struggle for ways to express that in photography. One simple way however is through blurred images. This is an impressionistic street scene with not enough focus. I shot this on my first outing with a new lens, the Sony 85mm 1.8. I didn’t purposely take this out of focus, it was a mistake, but I immediately liked it. It makes me think I should do more. I prefer images that leave something for the imagination; they are more engaging. I use a variety of techniques to abstract images but rarely lack of focus. It’s a valid form of simplification and now I wonder why I haven’t used it more. I think maybe it’s because I’m normally preoccupied with ensuring focus is tack sharp. It’s hard to break that habit, but if done intentionally and for a specific purpose, lack of focus is a way to impart a feeling or impression. It’s ironic that the most expensive lenses for photography are the ones that provide the most pleasing out of focus. The out of focus area produced by a lens is called “bokeh”. Reviewers will rave about the area of an image that is out of focus and how pleasing it is. The ability to focus a lens is a given, but to have out of focus areas at the same time, that’s another matter entirely. In fact that’s why I bought this lens, because of its ability to create pleasing bokeh while maintaining sharp focus on something else. Only in this case nothing is sharp. I could say I did this on purpose but you know I didn’t. I like the effect but in this case it was not enough focus dot com. As an American, one thing I will say about Europeans is they have an evolved sense of style. I took this in central Bologna around noon while I was busy snapping pictures of people. Most of my people pictures were not very good but this one I liked. It makes me think of the differences between Europeans and Americans. I could have spent my time taking pictures of the architecture and ancient landmarks, but the Europeans and their culture intrigue me. It’s instructive to observe how they carry themselves in everyday settings. By taking pictures of people in different places I am recording something a little more ephemeral than a ninth century church. Not that there’s anything wrong with ninth century churches. If you walk around and observe things around you, interesting things appear, they happen all the time. 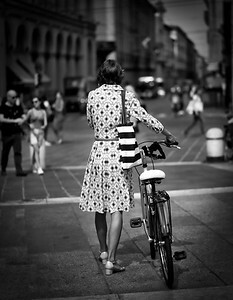 This lady has a delightful style and, she’s using a bike. The scene is reminiscent of something I’d expect to see in a fashion ad. If I saw something this in the little town in Florida where I live I would know for certain that hell had frozen over. But here in Italy a fashionable lifestyle is as common as an ancient church.